Foreclosure Delay: Will it help or hurt? Gov. Charlie Crist on Monday announced a 45-day moratorium on home foreclosures – but Lee County lenders and court officials said the measure would have little effect here and might actually harm the economy. County Clerk of Courts Charlie Green said the moratorium is ill conceived because it will interfere with a plan by court officials to push more than 25,000 backlogged foreclosure actions through the court system. Meanwhile, the number of foreclosures dropped sharply in November from a record October, a bit of encouraging news after two years of steadily worsening conditions. Crist called a news conference Monday with Alex Sanchez, head of the Florida Bankers Association, and Aletta Shutes, representing the state’s credit unions, to proclaim the “voluntary” respite for troubled homeowners. They emphasized that the break – which applies to both new foreclosure filings and foreclosure sales – only applies to homesteaded primary residences. About 30 percent of the foreclosure actions in Lee County in recent months have been homesteaded properties. Green and the Lee circuit judges plan in December to hold 2,555 hearings in foreclosure cases in order to schedule sales on the courthouse steps. In addition, lenders said, the moratorium has little potential to help homeowners. “His heart’s in the right place,” he said of Crist’s announcement. Elmer Tabor, owner of Wonderland Realty and chairman of the board of Cape Coral-based Riverside Bank of the Gulf Coast, said he doubts whether postponing sales on homesteaded property will actually keep anyone in his home. “Once they get the letter from the lawyer that says legal process has started, they bolt,” he said. “Then the house is typically in the court foreclosure system for six to nine months” with nobody living in it. As for Riverside, Tabor said, “I can guarantee you to a certainty” that none of its foreclosure sales in December or January involve an occupied primary residence. Until November, foreclosures had been rising steadily for more than two years as prices have fallen following the collapse of the housing market in late 2005. From a high of $322,300 in December 2005, the median price of an existing single-family home sold with the help of a Realtor has fallen 57 percent to $139,500 in October 2008, the last month available, according to the Florida Association of Realtors. 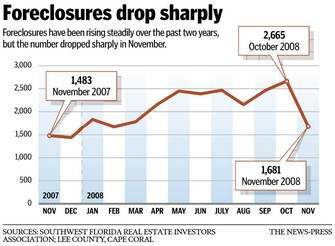 But the number of foreclosures filed in November dropped to 1,681, down sharply from the record 2,665 in October, according to a report Monday by the Southwest Florida Real Estate Investors Association. Foreclosures numbered 1,538 in November 2007. “It’s cool that there are a thousand fewer people last month who didn’t get their day ruined,” said Jeff Tumbarello, president of the association, but he’s not willing to call it a trend unless it continues through January. Some of the decline in November came because as a short month that includes Thanksgiving, it had fewer business days. But he noted that, even taking that into account, the number of filings per business day fell from 121 in October to 88 in November.